To make the fajitas I simply cooked sliced steak, onions, and red peppers in ghee with cumin, oregano, garlic, and salt. 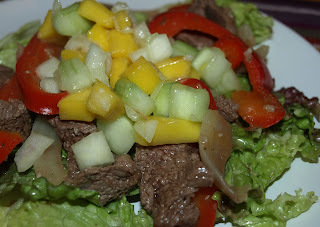 We served this on a very simple green salad with a vinaigrette dressing, and topped with the salsa. To make the salsa, mix together cubed cucumbers (peeled and seeded), cubed mango, diced red onion and chopped cilantro. Dress with olive oil, lemon or lime juice, salt and crushed garlic. Oh man, I have to try this!